A former fire department chief in the United States warned parents they could be risking their children's lives by leaving their doors open at night. While many children like sleeping with their door slightly ajar, ex-fire chief James Felton, from New York state, warned how simply shutting doors could save lives in the event of a house fire. 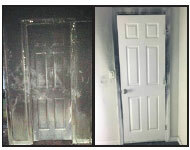 In a viral post on Cold Spring Harbor Fire Department's social media account, he shared two images of bedroom doors showing the impact of a fire can have depending on whether it is shut or open. The post has since gone viral and has received thousands of shares and comments from across the world.